Is customer database integration still a dream, or now reality? A single view of the customer is a concept that has been around for many years, but new research reveals the truth behind the CRM hype. If you are building a business case for investment in your B2B marketing data and CRM programme then this webcast will help. Learn about the new models of B2B marketing database evolution and understand how your company can profit from data as a service. Find out how your organisation’s approach to customer database marketing compares to that of other leading b2b companies, and take part in a live poll to benchmark your CRM approach. · Learn about the common difficulties faced by companies trying to implement an integrated approach to sales and marketing databases and how to overcome them. · Understand how new technology is allowing B2B marketers to access information, insight and intelligence on demand. · Take away some top tips on getting buy in from the rest of your board to investing in your customer database. 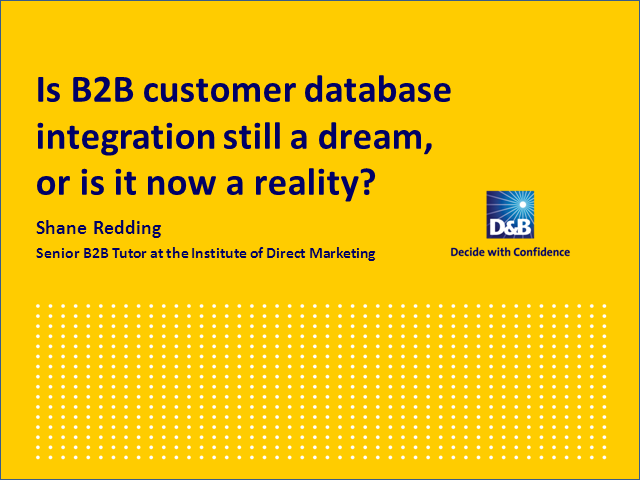 Title: Is customer database integration still a dream, or now reality?